Now you can access the latest information on the devices that fuel your technology-driven lifestyle. Serious technophiles and casual high tech consumers should bookmark and visit endlessyears.com, a timely blog penned by AMCP (Association of Marketing and Communication Professionals) Advisory Board Member Gregg Ellman. Gregg’s blog focuses on technology and specific devices that can make our lives easier. For example, his most recent installments analyze items that college students might utilize as the school year commences. 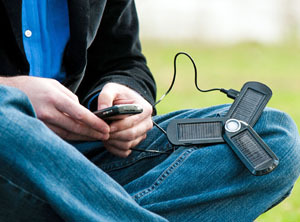 Included are a USB portable charger that uses the sun to power up portable gadgets, including cell phones, PDA’s, digital cameras, iPods, iPhones, and gaming devices. Gregg also tells time by looking at an alarm clock with a vibrating bed shaker that is placed underneath a pillow, as well as a wireless mouse, and a webcam. Mr. Ellman is a nationally syndicated columnist, media technophile, photographer and writer who can help us understand and even implement the latest tools of technology. He has shared his knowledge of gadgets, cameras and media technology since 2005. Gregg and his wife Sharon also have a photography business in the Dallas-Fort Worth area (www.ellmanphotography.com). 2010 Communitas Leadership Award Winner Xango, LLC (Lehi, UT) is heavily committed to fostering the health and wellness of its customers, which includes local and international communities. To better serve those communities, the recognized leader in health and wellness juices, skin toner and related products has embarked on a Season of Smiles from April through August 2010. The initiative inspired more than 150 company executives, employees, distributors and families to volunteer for trips to Tlaxcala and Guadalajara, Mexico, Chonburi, Thailand, and Ulan Ude, Russia. These Operation Smiles missions provided more than 450 children with free, life-changing surgeries to fix various facial deformities. In addition to improving the youngsters’ smiles, the program is altering destinies by enabling these children to eat and breathe well, attend school and become active participants in their own communities. AMCP judges selected the Season of Smiles program for a Leadership in Community Service Communitas Leadership Award, citing the initiative as “a real example of a company doing far more than just writing a check. Through its extensive volunteer efforts, XanGo truly epitomizes the spirit of Communitas — people working together for the betterment of the world community.” In addition to Season of Smiles, Xango also has an ongoing partnership with Operation Smile, and the firm distributes its Meal Packs to the world’s undernourished communities. We are proud to salute 2010 Communitas Leadership Award winner Xango LLC, and invite you to visit www.communitasawards.com to see a list of winners from this recent competition. 2010 Communitas Award Winner Brunet-Garcia Advertising (Jacksonville, FL) is literally changing the face of the nonprofit community in northeastern Florida. In addition to donating to various nonprofit agencies and launching three websites devoted to civic involvement, the full service advertising-public relations provider has instituted a formal corporate policy of offering five monthly hours of company time to any employee wishing to volunteer their time and talent. The AMCP judges were impressed with Brunet-Garcia Advertising’s quantity and quality of pro bono work, citing the firm as a great example of a company using its unique skills — in this case advertising and marketing creativity — to help nonprofits in their quest to serve the less fortunate in their community. Judges who determined Brunet-Garcia Advertising’s Communitas Award for Pro Bono Excellence in Community Service noted that the firm created its Block x Block community initiative in response to increasing litter and refuse on neighboring streets. The campaign actually inspired nearby businesses to join the agency’s employees and clean their street, and then recycle the refuse through a private collector. By working together to take a stand against litter, employees have provided the area with noticeably cleaner thoroughfares. In addition, the Brunet-Garcia led campaign has inspired others to clean up their own neighborhood areas. Please visit www.communitasawards.com to see a list of winners from this recent competition. 2010 Communitas Leadership Award Winner Farm Credit Canada (Regina, Saskatchewan) has taken a strong leadership role in its continued effort to fight hunger throughout Canada. The nation’s leading agricultural lender, FCC initiated its 2009 Drive Away Hunger (DAH) program to raise awareness about this critical cause for the national media and the general public. The DAH initiative enabled the media to report on a community project that unites businesses, youth and food banks by generating public awareness and providing timely and accurate information. AMCP judges, who bestowed a Communitas Leadership Award in the category of Leadership in Organization’s Community Service, credited the program with exhibiting strong leadership in creating awareness about fighting hunger. They noted that FCC truly epitomizes the spirit of Communitas – people working together for the betterment of the community. Please visit www.communitasawards.com to see a complete list of winners from this recent competition. 2010 Communitas Award Winner Blaine Anthony (Benton, MA) has a soft spot in his heart for children who are battling a disease. The owner of North American Safari, a hunting and fishing video production company, he frequently takes these youngsters on hunting and fishing expeditions to buoy their spirits, and their resolve to keep fighting. He produces the excursions for television, and he also tirelessly promotes the need for donations to various organizations. His nominator submitted a DVD entitled Hunting for a Cure that features St. Jude Children’s Research Hospital in Memphis, TN. Mr. Anthony has established a nonprofit organization, Hunting for a Dream, that enables volunteers to take terminally ill children on hunting and fishing trips to fulfill their last wishes. He has earned his Communitas Award for Excellence in Community Service. Please visit www.communitasawards.com to see which companies and individuals have earned 2010 Communitas Awards. Congratulations to 2010 Communitas Award winner bioMérieux (Durham, NC),whose employees have joined forces at hundreds of the healthcare company’s subsidiaries and sites worldwide to achieve its environmental goals. The firm’s guiding principle for sustainability, “We Belong To a Community”, is reflected in its commitment to consider the environment and promote sustainable development in all business aspects. The Durham home office team spearheads the “bioMérieux Goes Green” initiative that was started in 2008 by finding innovative ways to protect the local environment. For example, facility managers at the two Durham locations have led efforts to create green cafeterias, restrooms, and packaging processes, and to enhance energy efficiency and return power to the local grid with a recently-installed solar energy plant. In St. Louis, MO, bioMérieux North America opened a Gold LEED (Leadership in Energy and Environmental Design) certified facility last year, with plans for a second LEED facility in Durham already underway. 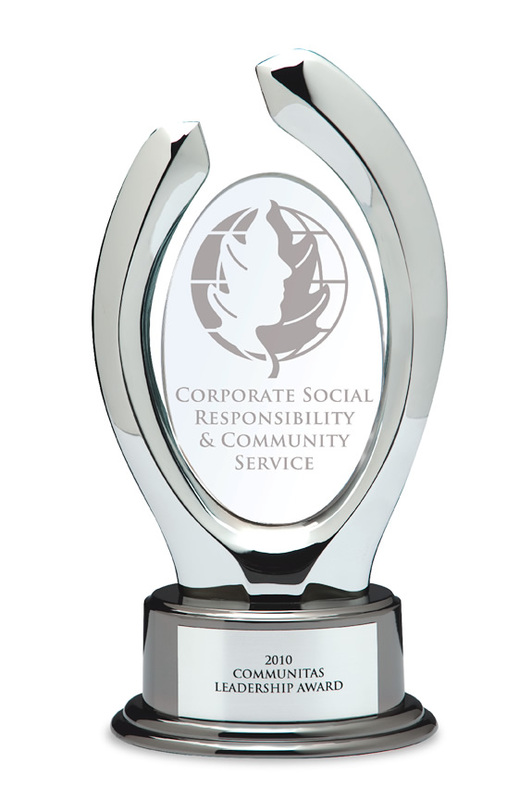 These and related company-wide efforts have been rewarded with a Communitas Award for Green Initiatives. Please visit www.communitasawards.com to learn about other Communitas Award winners. 2010 Communitas Award nominee West Basin Municipal Water District (Carson, CA) takes great pride in the commitment it has made to protecting the environment, one of its five core customer commitments. The provider of imported and recycled water to 17 cities and more than a million people in coastal Los Angeles, wholesale water agency is a leader in water conservation. Its programs impact industries, cities, adults and children. West Basin recently launched a program to send free water conservation kits to children who sign up for “Water Star” by saving 20 gallons per day. In addition, the agency is shifting to locally-produced water resources to reduce its overall energy use and carbon footprint while providing a sustainable supply of water. Its implementation of recycled water recently helped Honda’s headquarters location become a LEED (Leadership in Energy & Environmental Design) certified building. And, in partnership with Surfrider Foundation, West Basin offers free Ocean Friendly Garden classes that teach residents how to create more efficient landscapes by replacing part of their lawns with native plants and semi-permeable landscaping. Its current conservation focus is to save water outdoors, where most of the waste occurs in southern California. These and related company-wide efforts are being nominated for Communitas Awards for Sustainability and for Green Initiatives. Please visit www.communitasawards.com for printable nomination forms and information on how to nominate a deserving individual and/or business. Communitas Awards continues to process submissions as they arrive at Association for Marketing and Communication Professionals (AMCP) headquarters. 2010 Communitas Award nominee Northwestern Mutual (Milwaukee, WI) has invited its employees to leave their own personal legacy by introducing the “Leaving a Legacy for Future Generations” volunteer program. The initiative symbolizes Chief Executive Officer Ed Zore’s retirement gift to employees – four paid hours in 2010 to volunteer for their choice of a nonprofit organization. The gift reflects Mr. Zore’s commitment to the community during his 41 years of civic leadership. The outgoing CEO has also made the Northwestern Mutual Foundation the leder in Wisconsin with donations totalling more than $15 Million during Fiscal Year 2009. The “Leaving a Legacy” initiative official began when 100 employees built a new playground funded by a $75,000 foundation grant. The employees – who can enter and track their volunteer hours at a company-sponsored website — were joined by company retirees, Boys and Girls Clubs of Greater Milwaukee children and their parents, and Ed and Diane Zore. These and related company-wide efforts are being nominated for a Communitas Award for Company Sponsored Volunteer Project. Please visit www.communitasawards.com for printable nomination forms and information on how to nominate a deserving individual and/or business. Communitas Awards judges continue to process submissions as they arrive at Association for Marketing and Communication Professionals (AMCP) headquarters. Now you can access the latest information on the devices that fuel your technology-driven lifestyle. Serious technophiles and casual high tech consumers should bookmark and visit endlessyears.com, a timely blog penned by AMCP (Association of Marketing and Communication Professionals) Advisory Board Member Gregg Ellman. Gregg’s blog focuses on technology and specific devices that can make our lives easier. For example, Gregg’s latest entry analyzes an item that docks and charges any Apple media player (i.e., iPod and iPhone), and features an input to support any other model of MP3 player. He also writes about children’s headphones with soft padded ear cups, as well as a device that provides noise cancellation and dual microphone capability for those desiring hands-free usage of Blue Tooth capabilities. Mr. Ellman is a nationally syndicated columnist, media technophile, photographer and writer who can help us understand and even implement the latest tools of technology. He has shared his knowledge of gadgets, cameras and media technology since 2005. Gregg and his wife Sharon also have a photography business in the Dallas-Fort Worth area (www.ellmanphotography.com).